Minonk's orgins are tied to the development of the railroads in Illinois during the 19th century. In 1854 the Illinois Central Railroad completed its main line through Section Seven where the city of Minonk would eventually be located. On November 7, 1854 a plat of the town was recorded in the Office of the Recorder of Woodford County. The naming of the town is generally credited to David Neal, an agent for the railroad, who supposedly chose the name of a street in Boston, Massachusetts, on which he owned property. Another version is that he got the name from the Ojibwa Indians in which the word Minonk means "good place". 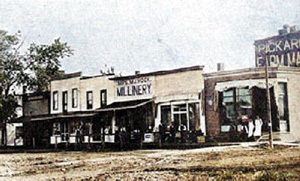 One of the first settlers in Minonk was Joseph Stonier who arrived in Minonk in the early 1850's to help build the railroad here. He boarded at the Jonathan Macey house, which was located on the present Oak Street on the site now occupied by the VFW hall. It is assumed to be the first building in Minonk and the Jonathan Macey family was the first family in Minonk. Eventually, Mr. Stonier bought farmland south of the present city border. Stonier married Nancy Jane Macey, daughter of the owner of the boarding house in which he stayed. They had 9 children. In 1889 he founded the Minonk Eagle Brick and Tile Works. He died in 1903. Descendants of the Stonier-Macey family reside in Minonk yet today. They include Jeff, Eric and Craig Meyer, sons of Barbara Morrison (deceased) and the descendants of John Ryan IV and John Ryan V.
The above picture is looking north on Oak Street from Fifth Street around the turn of the century.